I don't know about you, but I'm one of those people who feels elated to start the first book in a series. So much anticipation before I turn the cover open to begin reading. When I saw Keturah come across my email I was hooked immediately by the cover (isn't it always the cover), the author, and the synopsis of the story! Thanks to Litfuse Publicity for the opportunity to review it and set out on a journey. I'm all about the historical fiction. If it's well written, don't bother trying to talk to me because I'll be entwined in the story! That's exactly how it was from the first page of the first chapter in Keturah! From the start it was quite an adventure. Keturah is a character I can relate to. Her past has caused her to rely on herself and certainly never ask a man for help. Her and her sisters' present puts them in a situation that almost forces them to rely on the men around them. I enjoyed getting to know Ket, Verity, and Selah because it sets us up to want more when the next books come out! I was ready for book two by the time the sisters set sail on the Redemption. We also meet Gray Covington. My first thought was, "He must be a rake!" Something seemed shifty about him from the start. Guess that should teach me to judge someone by the first few sentences I read about them. Just like any of us, Gray made some poor choices and is doing what he can to redeem himself. 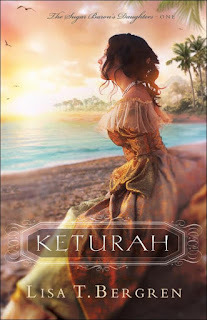 What Keturah (along with her sisters) and Gray have to go through to try and revive the plantations they own in the West Indies is more than most could bear. It's clear that it's going to be even harder than either one of them expected, and more dangerous. I loved everything about this story from beginning to end. The characters drew me in, rooting for and against them with a lot of fervor! I guess if there is any "negative" I felt like the story spent quite a bit of time on the ship, which meant it seemed like they were doing or talking about the same thing. Of course, if you're spending 6 weeks on a ship heading to your destination a lot can happen during that time. I'm already looking forward to book two! Finally a book that I can get into! I have been search for a series that I can enjoy but one that is not trashy. Thank you for introducing me to this series. I have been seeing this book and I have put it on my TBR list!!!! I can't wait to read it. I'm a stickler about reading books from the first one! Even if the book can be a standalone, I have to read the books in order! lol. this sounds like a wonderful historical read! This book sounds like an awesome read. And it is going to the top of my to be read list.